GB: Can you provide us with a brief history of Chiasm? What sort of music have you created over the years? Chiasm: I started the Chiasm project in the winter of 1997 while in grad school for molecular biology in Detroit as a creative outlet for my frustrations. In 1998 I self-released my demo album, "Embryonic", and played a bunch of shows while submitting my music to record labels. I was signed to COP International records in 1999 and debuted on their compilation cd "Diva x Machina vol. 3" in 2000. My debut album on COP, "Disorder", was released in 2001. I've continued to write new material and tour a bit since then, and have had several tracks released on compilation cds in the meantime. In 2003, COP released a remix album I had put together with labelmate TL5 called "Divided We Fall", in which we collaborated and each remixed five of each other's tracks for full-length album. My new album, "Relapse", is set for release on COP International this spring 2005. Although sometimes my writing style has been hard to classify, the music I've written has mostly fallen into some aspect of the dark electro/industrial gene. GB: How did you become involved with Vampire: The Masquerade - Bloodlines? Was your involvement with the game completely unexpected or were you actively pursuing such a project? Chiasm: They contacted COP International and asked to use my track, "Isolated" for their soundtrack, and there was some paperwork, and then the game came out. It was completely unexpected, and I didn't even know the title of the game or if it had been released until a fan contacted me about it on myspace.com. GB: When you accepted the Bloodlines project, were you given a list of the other bands that would be featured on the soundtrack? If so, were you familiar with the rest of the names? Any that surprised you? Chiasm: No, I was pretty much left in the dark until the game came out. I was familiar with Ministry, the Genitorturers, and Lacuna Coil already, and it was flattering to be included on a soundtrack alongside them. GB: Whose choice was it to feature "Isolated" on the soundtrack? Were any of your other songs considered first? Chiasm: I really don't know how the tracklisting was decided, but I've heard rumors that there was some probing in the gaming community to help decide what people might like to hear on it. GB: Were you surprised at the amount of exposure you received from Bloodlines? How have record sales been since the game was released? Chiasm: Absolutely, it's awesome to have had so much exposure, and the "Disorder" album is in it's third pressing as we speak. 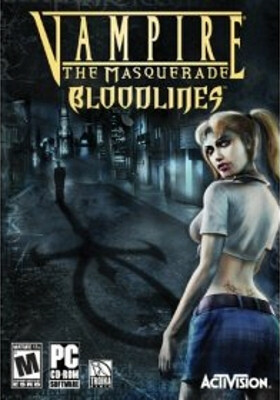 GB: Were you familiar with Bloodlines or the Vampire: The Masquerade setting before your involvement with the soundtrack? Chiasm: I was familiar with the role-playing game before Bloodlines came out. They used to have a Vampire: The Masquerade night at a local gothic coffeehouse when I'd first started writing music, and it made an impression on me. GB: Have you had a chance to try Bloodlines out yourself? If so, were you happy with the placement of the song in the Asylum nightclub? Chiasm: I'm very happy with the placement of "Isolated" in the asylum club. To me it seems the best place for it, and I guess it's made an impact on a lot of players. GB: Aside from Bloodlines, do you ever get a chance to play other video games or tabletop RPGs? Chiasm: Not a whole lot, I usually spend as much of my spare time as possible creating and recording music, which can become a pretty absorbing process in itself. GB: Any upcoming projects for Chiasm that you can tell us about? Would you work on another video game soundtrack if the opportunity presented itself? Chiasm: My new album, "Relapse", will be released on COP International records this spring 2005. I'm currently working on a video for "Isolated", writing new material and planning some shows. Of course, if there's another game that would like to include my music on their soundtrack, I'm all for it! Thanks Emileigh! Check out the official Chiasm website for more information about her and the Chiasm project.